Kill! is a movie about two men fighting over a chicken. That I can boil the film down to this is to praise Kill! 's economy and wry sense of absurdity. 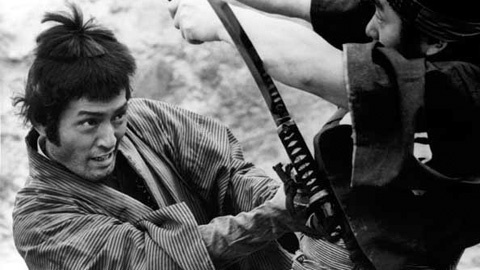 Here's why: while being based on the same source material that Akira Kurosawa used for 1962's Sanjuro (Tsubaki Sanjuro), Kihachi Okamoto's Kill! is about the absurdity of power struggles and the violence that surrounds them. 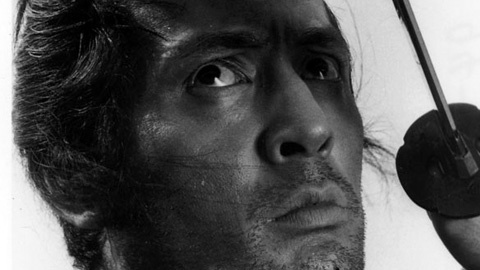 It's March 1833 and Hanjiro Tabata (vaguely horse-faced Etsushi Takahashi) is a farmer who wants to be a samurai. Genta (Tatsuya Nakadai), on the other hand, was once a samurai but is now a yakuza. With fate as their guide, they've both stumbled hungry and tired into the wind-swept streets of the desolate Joshu where corruption and political infighting have devastated the local economy. Hanjiro, it seems, has heard that this is a great place to find work as a samurai; Genta, on the other hand, is an impish sort who, having lost his taste for the samurai life, is in town to stick his thumb in the collective eye of society, maybe help some people on the way, and get a few free meals in the process. 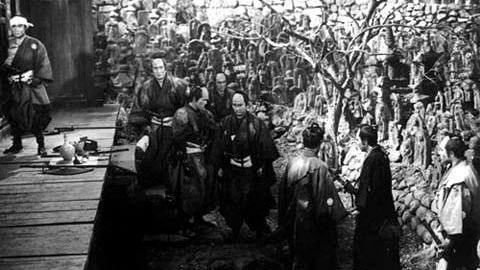 When a group of seven (formerly) dedicated samurai decide to split from their corrupt clan lord and try to overthrow him, they are double-crossed by one of their members, forcing them to hole up in a mountain retreat and fight for their lives. Genta, sensing a good opportunity for hijinx, knows that by helping out the seven, he can jam the system and perhaps foster some positive change. Hanjiro, though, is not the brightest bulb in the lamp, but what he lacks in brains he makes up for in muscles and a curiously firm sense of right and wrong. Forming an unlikely partnership, the two of them find themselves in the middle of this clan standoff and through clever planning and pure luck they help to right a moral wrong. As Kill! reaches crisis point we find the seven former retainers under siege from two larger and distinct groups of fighters, one equipped with bows and arrows and the other equipped with rifles. (Do you guys remember the two men and the chicken from the beginning?) Yes, the sheer firepower is over-kill, but the fact that one gimpy former samurai turned yakuza could outwit all involved - with the aid of a bone-headed farmer no less - and save this group of seven is incongruous. Oh, hell, why not call it what it is? It's just silly. Yes, the chicken in Kill! is a scrawny bag of bones and feathers. The absurdity of two grown men being so hungry that they would fight over it IS the humor. 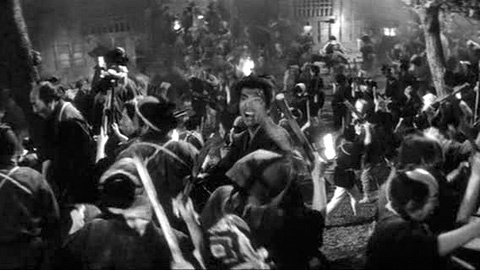 Similarly, the fact that seven former loyal retainers in a windswept, worn-out little village, would become the focus of such a large showdown, illustrates the bizarre lengths that the entrenched old guard of the clan will go to maintain the status quo (but, in a sense, they are no different than any of the upper echelon of the creaky mid-19th century Tokugawa system - or other time or place in the world, for that matter). This, of course, is the fun of Kill! 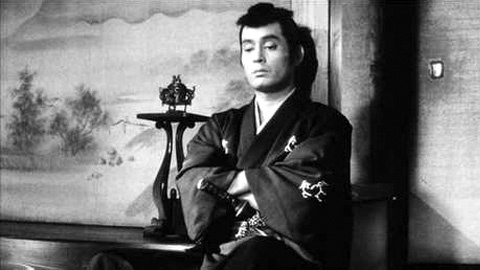 If Kurosawa's Sanjuro could be called wry or even cheeky, Kill! is meant to be puckish and goofy. To be honest, Kill! pushes its luck, at times, with its Tom and Jerry style sound effects and Etsushi Takahashi's mugging, but the craftsmanship is so high, that it ultimately overcomes any weakness. And sure, no review of the film can end without pointing out the oft-mentioned genre blender quality of the film - a marinade of chanbara, jidai geki, and Italian spaghetti western - but this ultimately is less interesting. Though Masaru Sato's standout score is inspired by 1960s Ennio Morricone (and others), ultimately, I prefer to focus on where the film began: the chicken.